Hobbii is a proud exclusive distributor of Happy Sheep, and thus you are always guaranteed the best price. Wool, wool, and more wool! 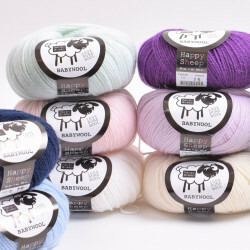 Happy Sheep develops woollen yarn for soft and beautiful knitting and crocheting projects. We have superwash-treated wool, merino wool, wool for felting and, of course, a lovely wool for knitting socks. 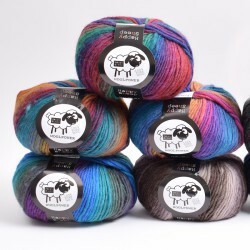 You can always find a large and exciting selection of beautiful color palettes whether you prefer soft one-colored skeins or bright multi-colored yarn. Wool has the advantage of being both warming and cooling. It is a natural temperature regulating product which can absorb up to 35% moisture without becoming wet and cold. 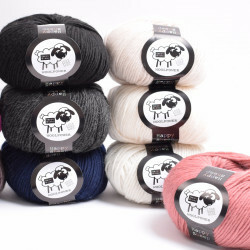 A lot of people think of wool as being a warm quality, but actually wool is very practical in the Danish climate and can be used all year round. If you want to take extra good care of your wool, it is important to follow the exact care instructions. Some wool qualities have to be washed by hand, while superwash-treated wool can be machine washed. Follow the instructions written on the yarn label. Furthermore, we also recommend you to use wool detergent. Wool is a very versatile yarn quality and is especially good for clothing. We have extra soft wool qualities for babies. Simple Wool is superwash-treated and can be machine washed at 86℉ (30℃) with a wool detergent. 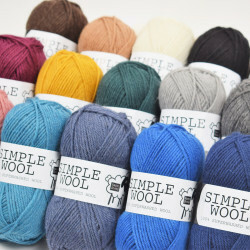 If you like the warm and naturally insulating qualities of wool, then Simple Wool is perfect for sweaters, cardigans, jackets, children’s clothing and much more. Simple Wool is available in many beautiful colors and has a slightly heathered effect, enough to provide your projects with a pretty color play. Starlight is a lovely, thick wool blend with a reflective thread spun into the yarn. The reflective thread adds a heathered effect, but will light up in the dark when hit by a light beam. Perfect for those dark months during which it is so important to be seen in traffic. Starlight is also superwash-treated so it can be machine washed at 104℉ (40℃) with a wool detergent. Woolpower is a fabulous, bulky wool yarn with a bit of a rustic look in large fabulous skeins of 3.53 oz. (100 g). The yarn is great for e.g. warm blankets, sweaters and cardigans. Woolpower can also be felted and is really good for e.g. felted slippers, mittens, and a lot of lovely interior items. Woolpower Print is the same as Woolpower, but with color transitions that slide beautifully from one color to the next and thus create beautiful, surprising hues. BabyWool is great for everything from baby- and children’s projects to sweaters and cardigans for the entire family. 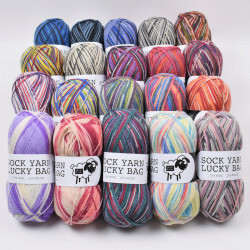 The wonderful yarn is 100% scratch-free and thus especially suited for adults and kids with sensitive skin. BabyWool is superwash-treated and thus you can easily machine wash it at 104℉ (40℃) on a wool program without destroying the fibers. Do you wish to see various yarns in use or do you lack further inspiration for the individual patterns? At Hobbii you can see pictures of other customers’ results. Click on the yarn in question and choose “Picture Gallery”. Here you can also upload your own finished projects as inspiration for both us and many others. Heartfelt thanks. Here at Hobbii, we strive to be some of the best and the fastest at delivering Happy Sheep yarn and yarn supplies. Thus, you always receive your goods no later than 3 weekdays after you placed your order online. We take great pride in having a high standard customer service and you can always call us, if you have any questions regarding some of our products. We always provide you with a full refund on goods ordered via our online shop. You are always welcome to contact us, if you have any questions regarding our Happy Sheep yarn, or if you need help with ordering. You can contact us via our contact form, and we will answer you as quickly as possible. We are looking forward to welcoming you as a customer. It's called Simple Wool because it's nothing fancy. It is just nice, squishy wool that knits up beautifully into all manner of clothing. I used mine for hats because I have so much family living in cold states and the winter has been so harsh that I thought more hats were in order. I will be getting more of this yarn in other colors. That's how happy I've been with it. Presently knitting a guernsey sweater in the round using this yarn. It is so nice to work with and such good quality, that I bought another couple of the bags. Great colors. Sturdy yarn and a good value. Shipping was fast. Happy to offer this to my sock customers. Gorgeous colors and perfect for felting. This yarn is a dream to work with! Beautiful feel to the yarn and it knits up easily for a sweater. Such great wool to work with and is so cozy!